Jamaican Black Castor Oil not actually Black? I get quite a few questions sent to this blog about Jamaican Black Castor Oil (of all brands). I think because of the name, people expect a burnt tar coloured substance to come out of the bottle. I am always confused by people who say it doesn't smell burnt enough! There are several fragranced JBCOs on the market and you can add the essential oil smell of your preference if you really do not like the smell of original/regular JBCO. [The JBCO I bought is]...not as dark as I imagined. The colour only matches that of a brown instead of dark brown. The smell of the oil, was not burnt as read from other articles. Shouldn't it be darker? The colour of oil is subjective and is usually described as golden brown to dark brown. It is not actually black, but much darker than general pharmacy castor oil. Also we don't describe these oils as having a burnt smell but rather roasted aromatic and more like Japanese teriyaki. Yum! Again this is subjective and many people do not like the smell. There are also darkened castor oils on the market sometimes given names like 'West Indian Castor Oil' these are not the same as authentic Jamaican Black castor Oil. They have not been made the tradition Caribbean way and have just been darkened to give a similar colour. I hope this helps for people that are unsure about the colour of the oil. If you are unsure if the oil you plan to buy is from a trusted source, make sure you purchase from one of the authorised distributors. These are usually listed on the maufuacturers site. So you havent joined the Naturalution and you like keeping your hair straight with a relaxer, there are several things you can do to take care of your hair. As your hair will be more fragile because of the chemicals in your relaxer (these break the bonds in your hair) you will need to treat it a bit more delicately and if you know how, taking care of relaxed hair isnt actually that difficult and doesnt have to be a chore! Dont relax hair too frequently - The generally rule on most relaxer kits is relax every 6 - 8 weeks, It is probably best to leave as long as you can, 10 - 12 weeks if you can. This gives you more new growth so that overlapping relaxer is harder and allows your scalp to rest. Dont overlap the Relaxer - adding more relaxer to previously relxed ends doesnt make them any straighter, they are already weak and all this does is cause them to fall off. Wash out the relaxer properly. If you must self relax as I am sure many of us have done at least once, make sure you use the nuetralising shampoo in the kit and follow the instructions on the kit. Some have pre-shampoo treamnets and some ask you to wait 5 mins before washing out. 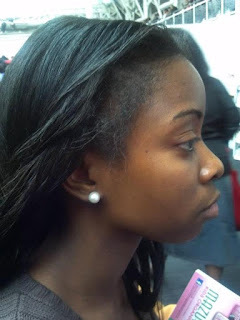 Make sure you follow this and wash out the relaxer as much as you can, 10 times if you have to! Follow the timing instructions, do not leave relaxer in for more time than it says on the box and use the correct relaxer strength for your hair type. If in doubt take your home kit to a professional and get them to do it for you. 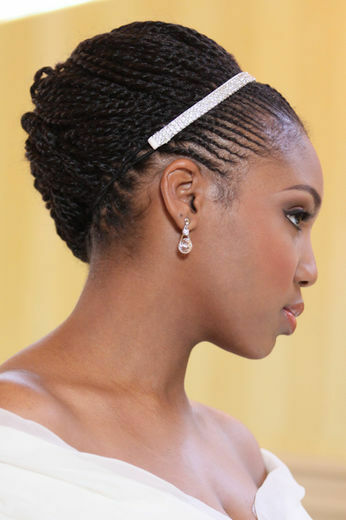 Moisture - Relaxed hair is dry and needs moisture. 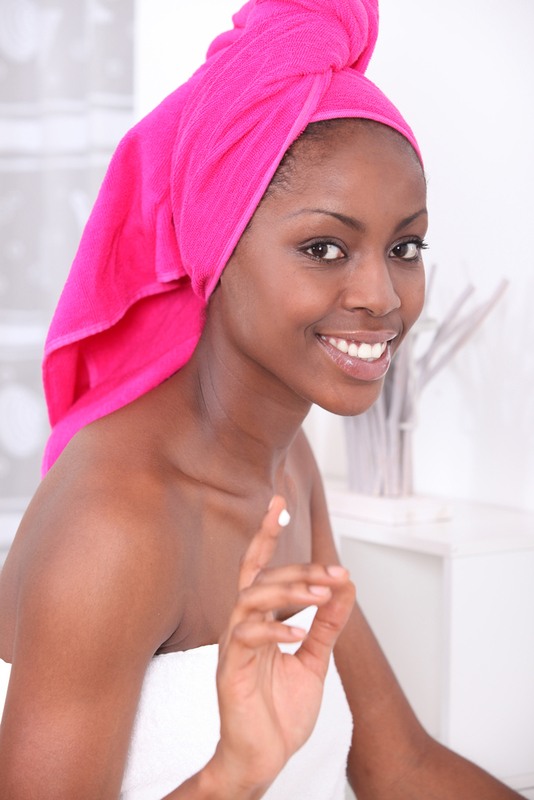 Wash your hair regularly, this keeps the scalp clean and brings moisture to your hair. Lock in that moisture in with natural oils - Coconut Oil, Jojoba Oil, Argan Oil, JBCO. So many wonderful oils with so many uses! I fing Jojoba Oil especially beneficial for relaxed hair! Invest in a good leave in conditioner and moisturise on daily basis. Shampoo your scalp not your ends. Over-shampooing ends will strip them of much needed moisture, thus leaving the processed ends extremely dry and prone to breakage. Condition your ends. Get most of your deep conditioner needs to end up on your ends. Avoid metal and plastic brushes and combs as they can pull out and break already weakened strands and cause the dry ends to frizz. Determine how often your hair really needs a protein treatment and switch between protein-based and moisturising products depending on your hair’s needs. I recommend trying products with Coconut Oil. It is definitely all it is cracked up to be! 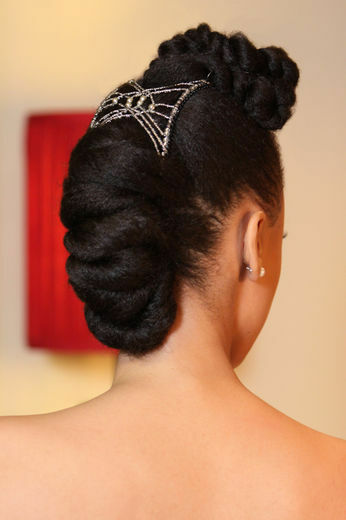 Up dos (such as buns) that look best with the ends tucked in allow you to and protect your ends during harsh weather. Stay away from regular rubber bands with metal parts because they will rip out your sensitive strands. I think I got most of them but If you have tips to share please post! We love to hear from you !! I think the delivery men who work for couriers must have a good old laugh when the get back to the depot. Yesterday I was doing my hair at around 8:00pm. Sebastian and Ruby were in bed my husband, Adam was out with friends. Me Time!! Yay. HeeHee! Not actually me but you get the picture! So there are I am naked as the day I was born, having just got out the shower, sitting at my vanity table doing all those womanly things you never get a chance to do ... shaving, lotioning, eyebrow plucking, combing, just the basic preening that other women probably do every day but I rarely get around to. I had just started plaiting my hair, so its all parted in six and half is up in pins and comb clips when the door bell goes! Who could that be, I wasn't expecting anyone. Running around like a headless chicken I finally find my dressing gown run downstairs and am about to open the door when I realise I have may hair half out half in plaits, GRR!! Whoever is out there better be prepared for a fright, luckily I hadn't gotten to my face mask yet. I didn't have time to get a towel to wrap around my head, so I open the door a crack and say "Hello" The young man from yodel passes me the package through the narrow slit. HaHa! nothing to sign. Then I say "Sorry, you caught me at a bad time"and eagerly close the door! Thank goodness the guy had dreads so I hope this is nothing he hadn't seen before. LOL!! As I retreat back up stairs I finally finish my braid out which comes out perfectly the next morning and I am happy! I had been experimenting with what went on my hair best for a braid out and I think I will stick with applying a creamy leave in like Mixed Chicks and then sealing with my oil mixture ( JBCO, Argan, Pimento, Coconut) then plaiting, after which I spray with a water based leave in like Jane Carter Revitalising Leave In and sometimes I use Rose Water! Just thought I would share this, LOL!! Has anything similar ever happened to you? Absolutely loved these pictures from the Edgestick Booth at the Afro Hair and Beauty show and had to post them. Such a great product for doing the edges especially for a sleek up-do! It is a nice small tool, especially when I am loathed to bundle up my GHD's and pack them, this cute little straightener is so easy to pack as it is light and small. Also I hate getting burned! Works for neating up weaves, braids and if you have natural or hair. Jamaican Black Castor Oil for Hair Growth Only? 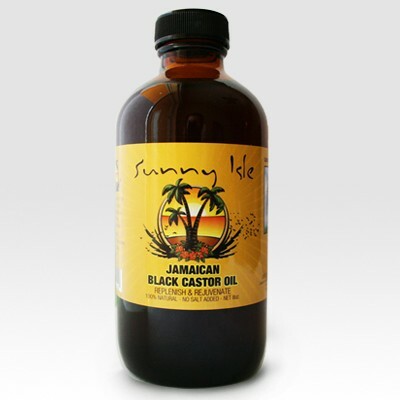 Jamaican Black Castor Oil isn't only for hair growth. It may surprise you to learn that many use it for acne, growing their eyelashes and aches and pains. My mum has always had beautiful skin, never had a pimple or acne in her life and though she wont admit it, she is closing in on 60 and still doesn't have any wrinkles. I can only hope I am that lucky, unfortunately I have always battled with oily acne prone skin and the dark circles are already showing. So when my mother told me she was unhappy with her skin at the moment as it lacked that glow she had always been so proud of in her youth and her skin didn't look as supple as he it had always done, I suggested that she use the Jamaican Black Castor Oil as you would for an acne treatment. Well the results have bee nothing short of a miracle. Her skin has bounced back and her glowing supple skin has returned after 3-4 weeks of treating it. I would never have thought that putting an oil on your face could be a good idea, but it worked. Cover both your head and face, and allow the steam from the water to hit your face. This will open up your pores. 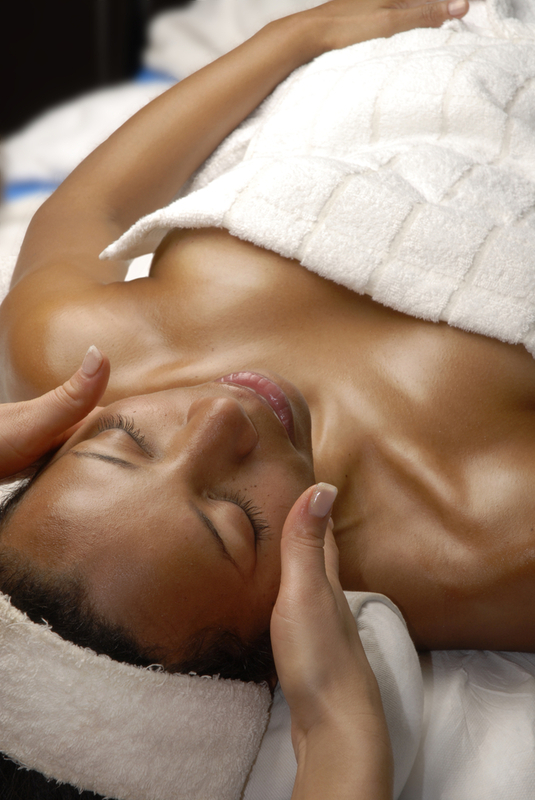 Apply Jamaican Black Castor Oil to the face massaging in a circular motions. Once the oil is evenly covering your face, leave on for a few minutes so it can be absorbed into the skin. Wash your face with warm water and make sure that all of the oil has been removed from your face. Splash your face with cold water, closing the pores. Then dry our face. Apply more Jamaican Black Castor Oil to your face and leave overnight. In the morning, cleanse with a mild cleanser. Washed her face with using a cleanser in warm/hot water to open the pores. Splashed with cold water and pat dry her face. Applied the Jamaican Black Castor Oil to her face. When she woke in the morning her skin had absorbed the castor oil. She said didn't feel greasy or oily. My mother does have near on perfect skin so it probably didn't require such rigorous treatment. I am so trying the complicated method as my skin is a mess. I am also going to try my mothers simple method on my blemished legs and see if it helps at all. 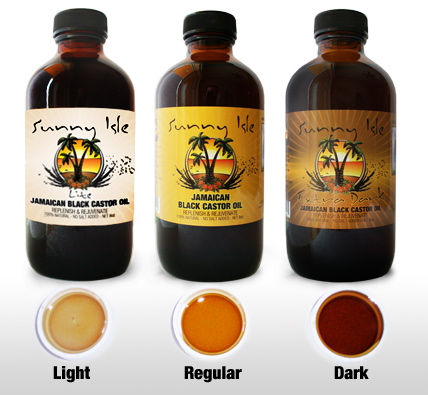 You can purchase Jamaican Black Castor Oil from The AfroDeity Online Store. 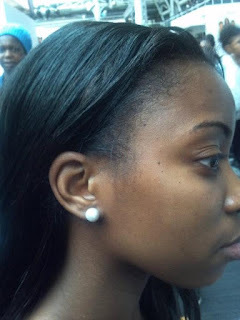 According to Mister Wiki, split ends or Trichoptilosis is the "splitting or fraying of the hair-shaft due to excessive heat and mechanical stress".There is no real way to repair split ends; when they occur, the split part of the hair must be trimmed. Those shampoo and conditioners that claim to cure split ends only really smooth over them giving the appearance of healthier hair. Moisturise and Seal: Lightly Moisturise daily by applying a water and/or a water-based, leave-in conditioner. No need to overdo this, you only need enough to spread through your hair. I do this at the end of the day and find that my hair feels better for this in the morning, Then I give it a light spritz with a spray leave in. After moisturising, apply an oil, butter, or a silicone-based serum to seal in the moisture from the water and conditioner. Again only a small amount in the palm of your hand is needed so that your hair doesn't end up over greasy. 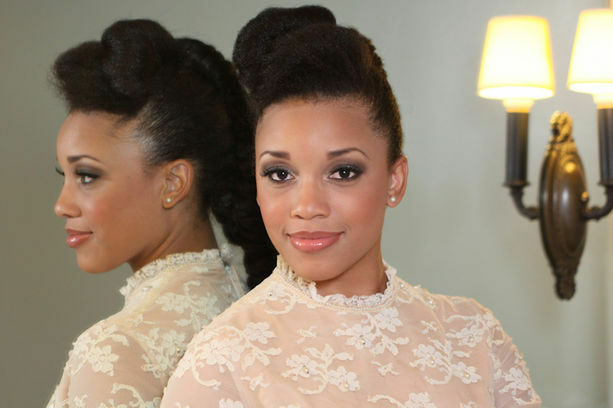 Protect: Protective styles like buns and pin-ups, braid outs are essential when growing your hair past shoulder length. 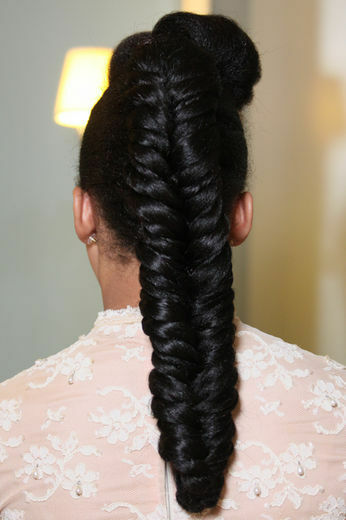 If you'd rather not twists or braids will hold moisture for longer. Deep Condition: Add weekly deep-conditioning to your routine. Dust & Trim: Not dusting yet? I try to do this once a month, I meticulous go through my hair ad cut small 1 - 2cm ends off damaged strands. Otherwise a good trim will get rid of those split ends and stop any further damage going up the hair shaft. Last tip: Try air drying. Using excessive heat on your hair will not help the situation. Do you have a split end problem? Do you have a great split end recipe? Post and let us know! 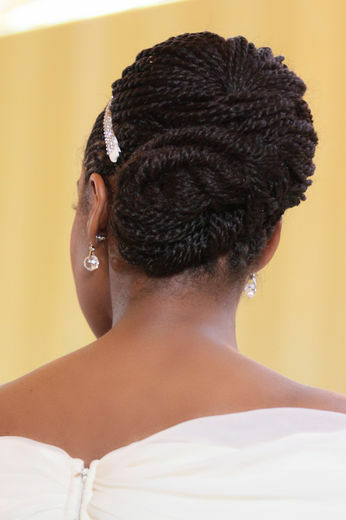 Whilst perusing essence.com as I do so often now, I found this great article on natural hair styles for your wedding day. For those of you getting married and looking for ideas or those of you dreaming about your wedding day or those of you that just love natural styles - Enjoy! 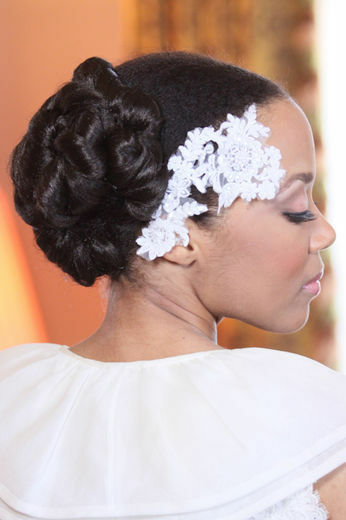 Anyone getting married and planning on trying these styles? 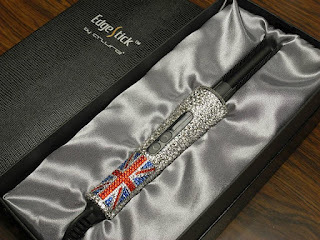 The folks from The Original Edgestick presented this exclusive crystal covered EdgeStick created for UK Olympic Gold Medal Winner, Christine Ohuruogu - complete with the Union Jack Flag at the Afro Hair and Beauty Show. Were you there? Did you get to see the Edgestick in action? The Crystal Edgestick is being launched soon so keep an eye out for it on our store. People Magazine has named Beyonce 'World's Most Beautiful Woman. Beyonce is only the second black woman ever to hold this title. You can find this article in the May 7, 2012 issue of People Magazine. Along with the article are stunning images of Beyoncé and a few of her most coveted beauty secrets….INCLUDING JANE CARTER SOLUTION! Want to get a chance to win Beyonce's go to Jane Carter Solution Products, enter our latest competition. Win a sample of the JCS Shampoo and Condition. 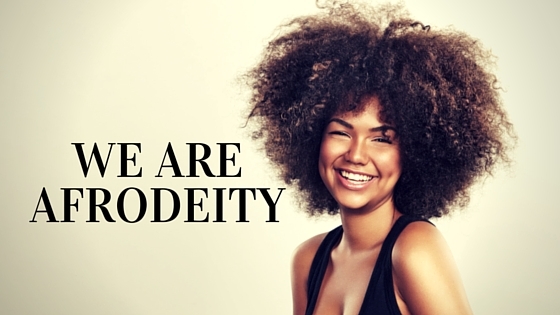 Just post on our facebook page.The most popular picture/post/comment of/about any AfroDeity product wins! Competition ends 00:00 on 06-06-2012. Note popularity is counted by number of friends that commented not number of comments. Get creative! Get your friends commenting! and get clicking! See you there! My son Sebastian is big on Hercules at the moment and although I am not a big fan of the story behind the movie, I mean please: Hera the doting mother!! The greek god Zeus' son is called Heracles, Can anyone say Titans and Perseus, Pegasus? ?, the muses?? and the list goes on and on. The one thing I can say about the movie is that I this is the first time I ever enjoyed watching a black or black inspired character in a Disney movie (This is some 10 years before Tiana, back in 1997). They all rock what they got and they all have different ways of wearing their hair. As in real life we all choose to wear our hair differently and I loved that all the muses had great hair dos. Apart from that, this film is a happy go lucky complete departure from the Greek tale of Heracles, but my kids love it!